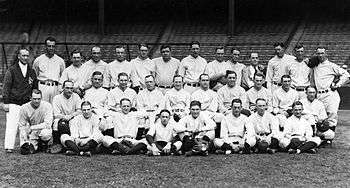 The 1926 New York Yankees season was the team's 24th season in New York, and its 26th season overall. The team finished with a record of 91–63, winning their fourth pennant, finishing three games ahead of the Cleveland Indians. New York was managed by Miller Huggins. The Yankees played at Yankee Stadium. In the World Series, they lost in 7 games to the St. Louis Cardinals, with the series ending with Babe Ruth being caught stealing second in the bottom of the 9th inning in game 7.